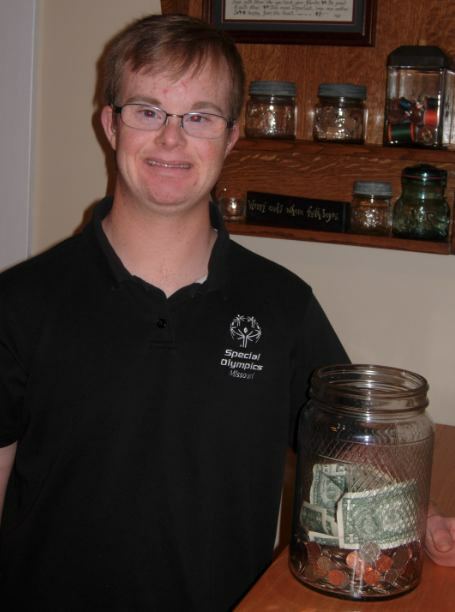 Jared Niemeyer is a familiar face around the Special Olympics community in Missouri. He’s competed for years in a variety of sports, served as a Global Ambassador and has again been tapped to represent SOMO at USA Games to compete in flag football. But it’s Jared’s work in his kitchen that’s been turning heads around the state. Jared put a large jar on a table in his kitchen and has been slipping coins and bills in it every chance he gets. When his brother comes home to visit, Jared hits him up for the money jar. Other visitors to the Niemeyers’ home have learned that Jared’s not shy about introducing them to the money jar, either. A couple of years ago, at a SOMO Leadership Conference, Jared heard a recurring theme about the SOMO Training for Life Campus, the planned training center for SOMO athletes. He heard that SOMO will need “buckets of money” to make the campus happen, so Jared improvised a money jar to get the party started, as they say. “Having the jar in our kitchen allows Jared to talk about the campus to visitors,” said Brenda Niemeyer, Jared’s mom. “He’s getting the word out to people involved in his life.” Jared, 22, lives with his family in Kirksville and works nearby. Inside the jar, Jared also keeps a postcard with a picture of the planned Training for Life Campus. The planned SOMO Training for Life Campus will serve current and future generations of individuals with intellectual disabilities, and will be the largest such facility in scope in the United States. The 44,000-square-foot Center will be set on an 11-acre campus between Columbia and Jefferson City, and will offer year-round training opportunities for athletes, coaches and volunteers throughout Missouri. We need to raise $12.5 million to make this a reality. If you’re interested in helping to fund this project, please contact Laurie Shadoan at shadoan@somo.org or (913)789-0353. For more than 40 years, our athletes, coaches, volunteers and staff have not had their own place to call home. Staff members have worked in borrowed or donated office space, while equipment and supplies were stored elsewhere. Athletes have trained and competed wherever open gyms or fields became available. Coaches and volunteers have followed them, relentlessly dedicated – and always cheerful – to bring athletes together for physical fitness, health & wellness screenings and social camaraderie. For SOMO athletes, this will be like U.S. Olympic Committee’s training facility in Colorado Springs, Colorado. To learn more about the Training for Life Campus, visit http://somocampus.org/ or contact Laurie Shadoan at shadoan@somo.org or (913)789-0353. SOMO is proud to offer donors a generous tax benefit through our participation in the Neighborhood Assistance Program (NAP). When you make an eligible gift of $2,500+ to the campaign, the NAP tax credit allows you to subtract 50% of your total contribution from state taxes owed. To see if you qualify, visit https://somocampus.org. The following is an interview with Eli Johnson, 5, from Skidmore, and his parents, Roger and Kathy. The Young Athletes Program is designed to reach out to children with intellectual disabilities ages 3 to 7, and to welcome them and their families to the Special Olympics movement. What do you like most about being in Special Olympics’ Young Athletes Program? What’s your favorite sport/play activity? Why? I like t-ball , baseball and basketball because my older brothers play. I like catching the ball and playing with my friends. Do you have a favorite sports hero? Who? Yes, I like Billy Butler. He plays for the Kansas City Royals. Do you have a favorite sports team? Which one? Yes, I like the Iowa Hawkeyes and the Kansas City Royals. What’s your favorite toy to play with? Why? My favorite toys are tractors, animals, bullriding, Playmobil and hot wheels. I just like them because they are fun. I can pretend with them. How long has your son been involved in Special Olympics’ Young Athletes program? What is your child’s favorite sport/activity? Why? Eli enjoys t-ball, basketball, track and field Little Feet Meet. He enjoys competing like his older brothers and being part of a team. Eli does not see any limitations when he participates. How did your child / family become involved with Special Olympics? Three years ago they started a Young Athletes Program in the county where we live. Eli started attending the four week sessions where he plays games and meets other children with disabilities. Then as a young athlete he was invited to the Little Feet Meet track and field day where each young athlete participates in the open ceremonies and three events: running, standing long jump and throwing a tennis ball. Eli loves going and he looks forward to participating again this coming spring. What has your son gained from his participation in Special Olympics? Eli is not as shy. He tries different activities. Eli is able to compete like other kids and he feels important because of it. It helps him to not see barriers. Describe your proudest moment regarding your child’s participation in Special Olympics? Our proudest moments are seeing how excited Eli is when competing and trying new things. 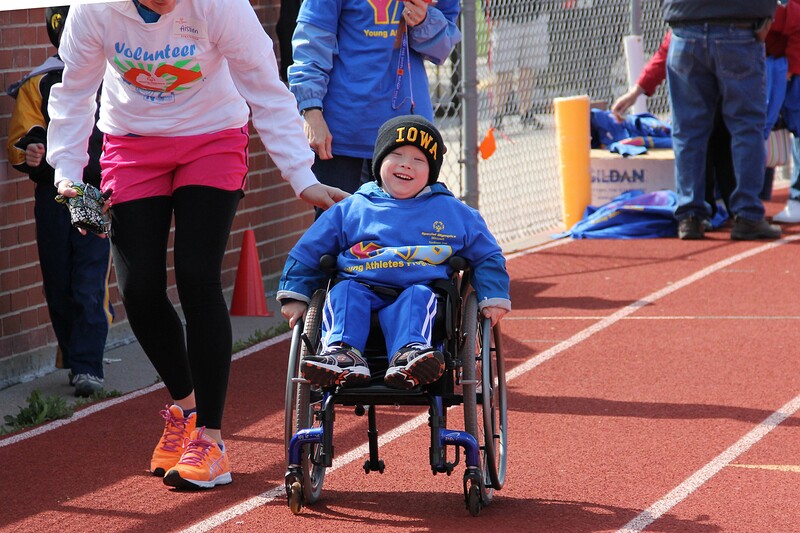 We love Eli’s smile and pure joy as he runs down the track. 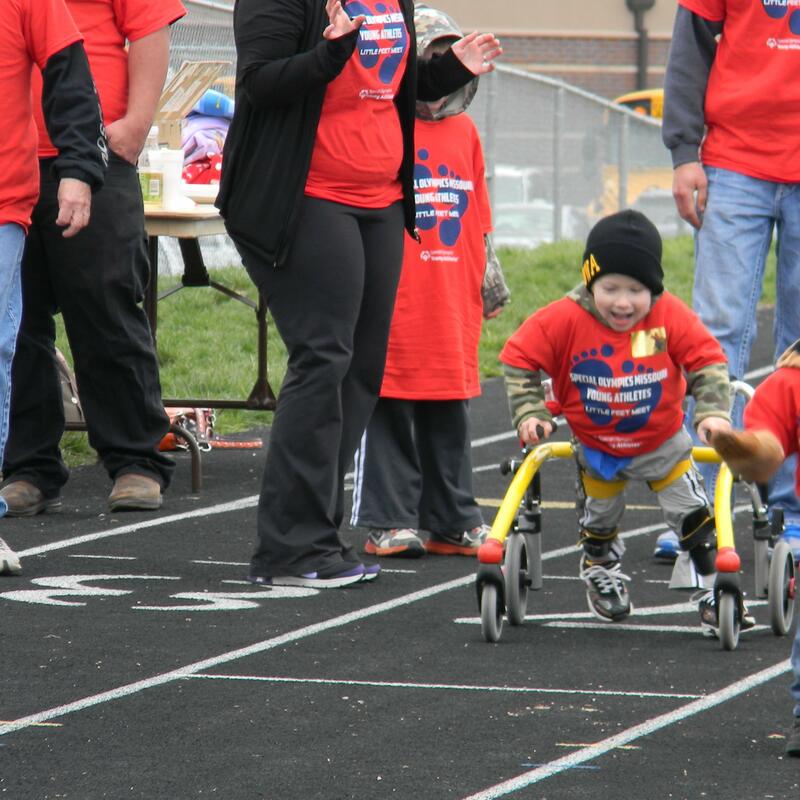 We are excited to see how proud Eli is when he participates in the track and field Little Feet Meet opening ceremonies while the crowd is cheering. Eli has developed a feeling of self worth by participating in Young Athletes Special Olympics. We have also enjoyed seeing how supportive Eli’s older brothers are when watching him participate. Eli is determined to do everything on this own.